While there is no cure for psoriasis, an autoimmune skin disease, the science of psoriasis therapies is evolving at a very rapid pace. The recent Cosentyx® approval heralds a new era for psoriasis treatment at SkinCare Physicians’ Psoriasis Treatment Center near Boston. Cosentyx® (secukinumab), a biologic therapy developed specifically for psoriasis, is now available for adults suffering from moderate-to-severe psoriasis. This is the first of several highly anticipated “second generation” biologics to complete rigorous testing and become available to treat this significant life-impacting disease. Cosentyx® targets interleukin-17 (IL-17), one of the key chemical hormones that are elevated in people who have psoriasis. We now know that psoriasis is driven by underlying and excessive inflammation, and IL-17 is one of the critical entities involved in this process. With this novel treatment, clear skin may now be a reality for patients suffering from psoriasis. 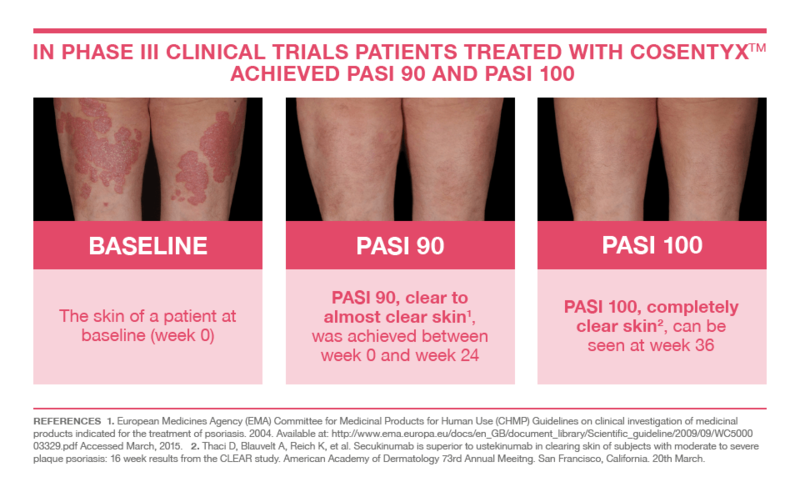 In clinical trials, the success rate was astounding with over 70% of subjects achieving clearance or almost clearance of their psoriasis within 16 weeks. Common side effects included uncomplicated cold symptoms, headache and mild diarrhea. Cosentyx® joins Enbrel®, Humira®, Stelara® and Remicade ® as biologic options for treating moderate-to-severe psoriasis. The addition of Cosentyx® to our psoriasis treatment armamentarium is a big win for patients still suffering from this disease. The odds are now exceedingly high that any patient who medically is a candidate for these therapies will find a treatment that works for them. And the good news is that this is just the beginning. There are at least 4 other promising second generation biologic agents for psoriasis currently in their final stages of testing that may see approval in the next 1-3 years. It is an evolving and exciting time, and our Psoriasis Treatment Center in Boston has never been more equipped to help patients manage this disease. Cosentyx is approved for adults age 18 or older. There are, however, effective psoriasis therapies that are available for those less than 18. Enbrel is approved for psoriasis ages 4 and higher and Stelara for ages 12 and higher. We suggest a consultation with a dermatologist if interested in finding out more about these options. Is it ok to have tattoos done on my skin?? – I have been on Corsentyx for 10 months. Prior to corsentyx I had severe Psoriasis all over body, face and scalp and 6 weeks after starting Corsentyx (Apr 2018) I became completely clear and still am upto writing this comment. There are 2 potential concerns: first, injury to the skin can sometimes induce a new plaque of psoriasis. Second, as cosentyx can increase your risk of infection, you may run a higher risk of skin infection with the tattoo procedure. So these are relative contraindications, they are not absolute. When using Cosentyx – which I have been on now for 6 weeks – can I have cosmetic fillers applied to my face? I am having trouble finding an answer to these questions. Yes, receiving fillers is acceptable when on biologic therapies, including Cosentyx. Be certain that your skin has been cleaned prior to the injection to reduce any risk of skin infection. Could this medication heal acne? Hello, Cosentyx is approved solely for psoriasis and psoriatic arthritis. It has not been studied for acne.